The S9300 and S9200 are high-power zoom models equipped with 18x optical zoom NIKKOR lenses utilizing thin optics, and offering improvements to specifications available with the popular COOLPIX S9100 released in the spring of 2011. The backside illumination CMOS image sensor and lens-shift vibration reduction (VR) system built into these cameras enable capture of beautiful photos of even dimly lit or dark scenes. The S9200 is a basic model while the S9300 also offers a built-in GPS function. A new movie function for saving and playing back movies, which allows for recording of multiple scenes that are then saved as a single file, has been adopted. 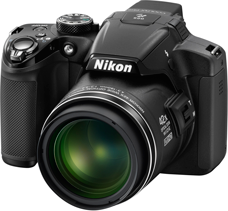 The S6300 is a new model for the popular high-power, compact zoom model class. It offers one of the most compact bodies in its class despite the built-in 10x optical zoom NIKKOR lens. It also offers an effective pixel count of 16.0-million pixels and is equipped with a lens-shift vibration reduction (VR) function that makes the most of superior camera shake compensation precision. The S6300 offers superior image quality for both still images and movies recorded with its full-HD compatible movie function, as well as excellent balance between still image and movie recording functions. The S4200 and S3200 are slim and stylish models that are slimmer than their predecessors despite improved zoom function and built-in VR. The P310 is the successor to the COOLPIX P300, which last year established a new branch of compact, wide-angle zoom cameras in the COOLPIX P series. It is equipped with a lens offering the same fast maximum aperture of f/1.8 that was so popular with the P300, and exhibits a number of advances, including even better image quality from its 16.1-million pixel image sensor and a lens-shift vibration reduction (VR) function for camera shake compensation equivalent to a four-step increase in shutter speed. The P510 is a compact, high-power zoom camera with an even greater zoom ratio than its predecessor, the COOLPIX P500, which represented a landmark in the history of the COOLPIX series with the highest zoom ratio ever. This new model is equipped with an amazing 42x optical zoom lens that covers angles of view for a broad range of focal lengths, beginning at the wide-angle 24 mm to the telephoto 1000 mm*. The Q510 also offers the same lens-shift vibration reduction (VR) function for camera shake compensation equivalent to a four-step increase in shutter speed as the P310, and is also equipped with a new GPS function. Both the P310 and P510 are also equipped with a backside illumination CMOS sensor with an effective pixel count of 16.1-million pixels for significantly less noise with shooting at high sensitivities. This results in the beautiful images with little noise that users expect, even with shooting in dimly lit surroundings. They also offer a noise reduction burst feature that utilizes automatic image overlay technology, which is applied with shooting in Night Portrait, Backlighting, and Night Landscape scene modes, to produce images with minimal noise. The P310 and P510 are also equipped with a number of other shooting and editing functions, including COOLPIX Picture Control, which can be used to adjust the vividness of colors or degree of sharpening applied to images prior to shooting according to the type of subject or scene, shooting conditions, or intent. What's more, frequently used shooting menu items can easily be assigned to the new customizable function button, making the full-scale photographic capabilities demanded by users even more simple. The L810 maintains a compact size despite its 26x high-power optical zoom lens. The L26 and L25 are entry-level models that offer 5x optical zoom and automatic shooting functions that make taking beautiful pictures simple. Despite its compact size, the L810 is equipped with a CCD image sensor with an effective pixel count of 16.1-million pixels, a 26x optical zoom NIKKOR lens that covers angles of view from the wide-angle 22.5 to super telephoto 585 mm (equivalent in 35-mm  format), and a new lens-shift vibration reduction (VR) function. It offers the same form that supports a firm, steady grip and side zoom control that have made previous COOLPIX L-series models so popular for their high performance. The L26, with its CCD image sensor with an effective pixel count of 16.1-million pixels, and the L25, successor to the COOLPIX L23 (released in February 2011), are equipped with a 5x optical zoom NIKKOR lens and a large and clear 3-inch TFT LCD monitor. In addition to Easy auto shooting mode for simple capture of photos exhibiting superior image quality, and an independent movie-record button that enables movie recording with the press of a button, both of these models are powered by AA batteries that can be purchased anywhere. These compact digital cameras are so easy to use that even first-time users will find taking beautiful pictures extremely simple.